The Garden Writers Association Foundation (GWAF) just released its 2013 Winter Gardening Trends Research Report and with it is some food for thought. “Among the 68 million gardening households that have a lawn, garden or grow plants in containers, 81.5% (~55.5 million households) have grown edible plants (fruits/vegetables/herbs) since 2009. Growing methods used by this group include: 35.3% grew edible plants in the ground; 15.6% grew edible plants in containers; and 30.6% grew edible plants both in the ground and in containers. Among the ~55.5 million households that have grown edible plants since 2009, 91.4% (~50.7 million households) grew edibles in 2012. Only 8% of households growing edible plants since 2009 did not grow in 2012, and the main reasons given were: took too much time (40.9%), lost interest (22.5%), efforts were unsuccessful (19.0%), moved to a location where gardening wasn’t possible (17.8%), too expensive (12.6%) or too much work (6.4%). Among all U.S. households, 51.9% (~57 million) report they anticipate growing edible plants this year, representing an expected 11.3% increase in households growing edible plants for 2013. So for everyone reading, where do you fit with these numbers? Why do you plant the garden edibles or for others, why not? Somehow my guess would be beyond this survey sample that time would be given as the number one reason. And then next in line - losing interest; it seems pretty typical for any hobby one undertakes if you don’t ensue it with a spark of enthusiasm. So if you want to be part of the edible trend, commit yourself to a passion well worth the freshness. For everyone else, please support your local farmer. Of course I must wrap this up with a Friday quote. From one of my favorite musicians, John Mayer. “If you had started doing anything two weeks ago, by today you would have been two weeks better at it.” How true. So the question is will you be committing yourself to an edible garden in the next two weeks? Planning counts so let’s get to it. Footnote: The above quoted information is an excerpt from a weekly newsletter for +GWA Members, of which our company, Bilowz Associates Inc. are members of and have access to a free copy of all the survey reports. 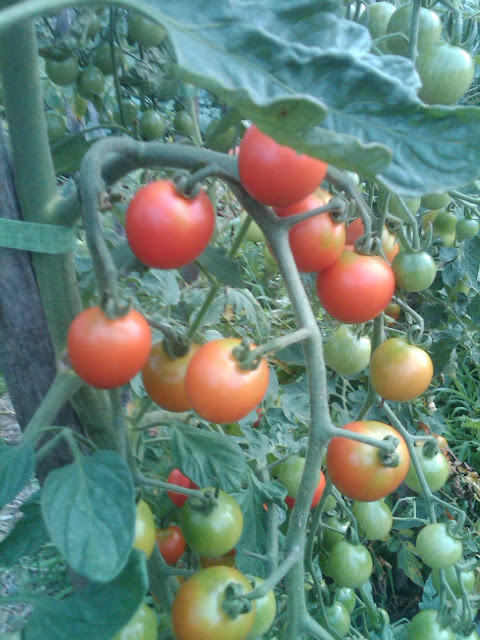 Image by Ann Bilowz © (From our photo archives) Cherry Tomatoes – Everyone can grow them!